Nike Vision has been a bit of an under dog on the Running Sunglasses scene. Always been producing high quality and good looking eye wear. Last years Road Machine opened up our eyes for Nike Vision! Fit: Nike used a good combination of materials on these glasses to provide structure and comfort at the same time. The areas of the glasses that come in contact with the nose and ears are comfortable rubber, while the areas that stay elevated are plastic. The placement and shape of the nose piece keep the frame from touching the eyebrows, which helps with air venting as well as comfort. Run X2 comes in two different sizes, a great way to go for perfect fit. Run X2 S fits smaller. 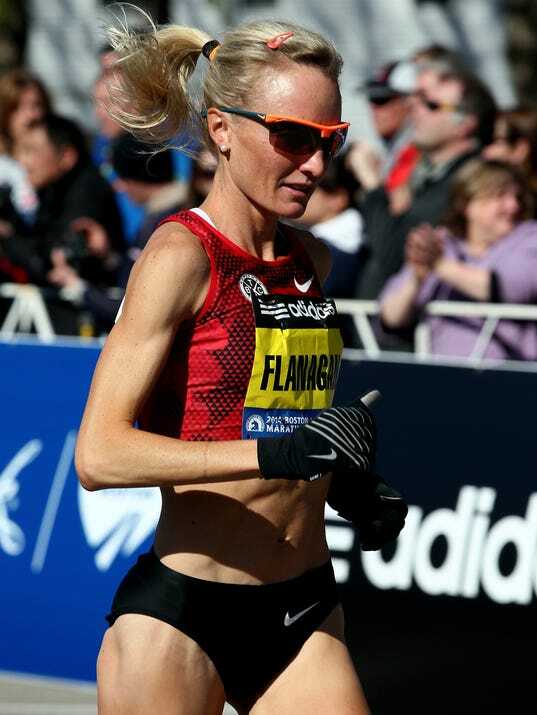 Shalane picked Run X2 for this years Boston Marathon! Sun Blockage: Excellent, by virtue of the dark lens option and size of the lenses. Venting/Antifogging: These lenses don’t fog at all, and the placement of the nose piece provides ample room so that sweat drops were never an issue. Best For: Bright, sunny days. These are a great everyday option. Drawbacks: Performance vise, nothing we can see. The price tag is on the higher end.